The buses arrived shortly before 10 a.m. and before long, the students, ranging from Grade 3 though 6, were seated across the fire from each other, singing, drumming and competing to win the other team’s sticks. Howitt principal Steve Brown welcomed the visitors to the game site. "We could have done this in the gym. But it's better in the Longhouse," Brown said. "We're here to have fun. We're here to make connections, to lift our spirits. And to learn about lahal. To learn our language and our culture." SD 70 trustee Jane Jones welcomed the visitors to Tseshaht and Hupacasath traditional territories first in Nuu-chah-nulth, then in English. "Woah! Lahal!" Tseshaht cultural expert Darrell Ross quipped in his welcome address, noting that when he was growing up, he was fascinated with the traditional games being played by the grownups at the nearby Somass Hall. "The singing was special. You could hear the joy in the songs," he said. Sadly, he noted, he was not able to learn those songs when he was a youngster. Ross explained the significance of the Thunderbird mural that dominates the interior of the Longhouse, and how it relates to Tseshaht culture. “Tseshaht were great whalers,” he concluded. Trish Cathrine, vice-principal of Nanoose Bay Elementary, credited SD 69 Indigenous Liaison Worker Linda Robideau with sparking the lahal initiative. Robideau, a member of Ditidaht First Nation, has been with the district for 12 years. "We've been learning the sport of Lahal through Linda, who is a big part of our school. She has been coming into classes, teaching the games, teaching the songs and practicing. We're really excited to be here to play with John Howitt, and sharing the day with them," Cathrine said. "We're really excited, because we have our Hulquminum language teacher, Colleen Manson, here with us. We have four students that are going to give a short speech thanking John Howitt in Hulquminum." And as promised, four Nanoose Bay students delivered a thank-you to John Howitt in Hulquminum. The Howitt delegation was composed of Mr. Mott's Grade 3-4s and Miss March's Grade 5-6's, according to Brown. "The idea for this came from our Nuu-chah-nulth Education Worker, Gina Sutherland,” Brown said. “In the past few weeks, we have had lahal in the school, we have had tournaments with different schools in the Valley, and Gina came up with the idea of connecting with a school in a neighbouring community." When it was pointed out that the majority of students on both sides were non-Indigenous (note that principal Brown referred to “our language” and “our culture”), Sutherland said the goal is to welcome children from other backgrounds to experience Nuu-chah-nulth culture, and to feel included. "We always emphasize that it is about self-esteem, and confidence-building and team building together,” she explained. “We want children to come out of their comfort zone and get comfortable with themselves – knowing who they are and where they come from." For her part, Robideau agreed that teaching Indigenous culture to non-Aboriginal children helps build understanding and a sense of "We," versus "Us and Them." "I love explaining to non-native people about who we are and how we lived, where we lived, and that we come from such caring – and sharing – people. "I love teaching about our culture and our history, and lahal is part of it," she said. "I grew up around lahal. My dad was a great player. It's all about fun." Lahal was played up and down the coast, "even down to the states," Robideau explained. As the frenetic action played out in the Longhouse, Robideau provided Ha-Shilth-Sa with a simplified outline of the sport of lahal. Two opposing sides start with five sticks, then compete briefly to obtain the King Stick. "Whoever wins the King Stick starts the game," she explained. There are two bones: one marked, one unmarked. One player holds a bone in each hand and the other side tries to guess which hand the marked bone is in. "If the pointer guesses the marked one, I win a stick," Robideau explained. The goal is to play until one side wins all the sticks. It must be added, that, during each sequence, the guessing team is drumming and singing lustily. When the singing stops, a stick is either taken or relinquished, depending on how the guessing worked out. As the action played out, the opposing piles of sticks alternately grew and shrank, with no end in sight. "It can go on and on for hours – or it can last 20 minutes," Robideau said. Robideau said both John Howitt and Nanoose Bay students play lahal in the school, including at lunchtime. "This is a cultural exchange. Hopefully, these kids are making new friends,” she said. “Now, Nanoose Elementary will invite John Howitt to come to our school, and we will host them in lahal." Watching from the top row of the Longhouse, SD 70 chair Pam Craig said it was encouraging to see Indigenous and non-Indigenous children playing a traditional game with such enthusiasm. “This is a new generation,” she said. Taylor Blaise presents artist Connie Watts with a thank-you gift. 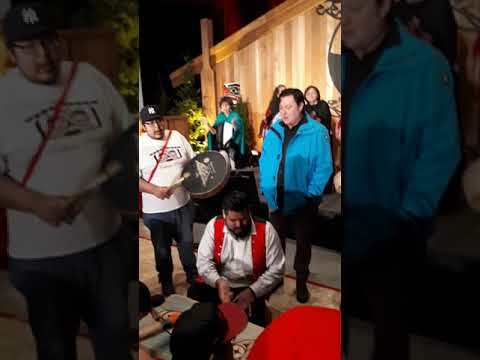 Nanoose Bay students sing in Hulquminum. Ditidaht First Nation member Linda Robideau has served as the Indigenous Liaison Worker for School District for the past 12 years..